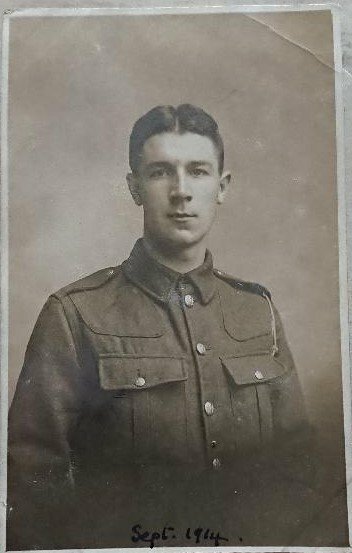 Yesterday I recieved this photo from a distant relative, thinking that it may have been my distant cousin Kia 1917, but he was a Signaler and Telephonist in the RGA - so assume that this photo is of his brother who survived the war. I know nothing of the brothers service other than his name, can anyone Identify the uniform and cap badge. He was from West Yorkshire not that this really helps. sorry Info Is vague but it is all i have to go on. 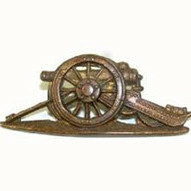 Army Service Corps is a possibility for that cap badge. 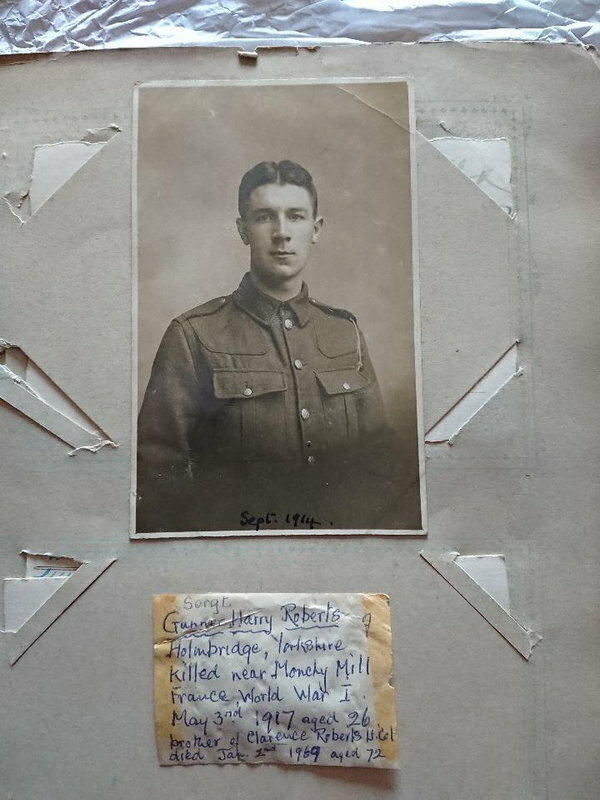 Hi, further Info recieved today from family says " Clarence "Bobby" Roberts was Second Lieutenant of 32 Infantry Brigade HQ. " does this help with possible ID ??? of course their remains the possibility that Clarence is not the subject in the photo but perhaps an unknown relative,? it was in the same album as clarences brother Harry Roberts RGA kia 1917 i attached a confirmed photo of Harry here. Neither photo relates to a commissioned officer, Lt. Col or 2nd Lieutenant. I wonder if the handwriting should read L/Cpl rather than Lt Col? Tentative - a Clarence Roberts was commissioned as 2nd Lt into the Duke of Wellington's (West Riding ) Regiment on 31 July 1918 from an Officer Cadet Unit (London Gazette) 32 Infantry Brigade had one battalion of the W Riding Regt, the 8th, although it was disbanded in Feb 1918. That does not mean that he could not have been in 32 Bde HQ. I find no National Archives record for him. A Private Clarence Roberts of the W Riding Regt has a medal card but was discharged unfit (medal roll) on 30 Jul 1918, unlikely to have been the man commissioned? Card has an address The Morlands Syston Leicester. Whatever, the first photo is not of a W Riding man and the combination of the name and ASC rings no bells. jigsaw pieces that fit some puzzle but maybe not this one? Really appreciate the help and advice offered especially as I could not be considered a fellow collector . (I was once - Indeed I guess most Schoolboys of my generation probably had Interest In the War(s) and almost all had a small family collection. I enclose the "note" which could Indeed be mis spelled re rank. Possibly further Information will come from this new (to me) living family relative, I am not In any contact with them, It Is my First Cousin who Is speaking to them and passing Info to me, as a third party so to speak. If so forgive me , I was and Indeed still am excited at the potential growth of the family History. Again thank you to the ones who took the time to read my post and to the ones who felt they could offer further Information. Harry Roberts and brother Clarence are in 1911 Census for Holmbridge Yorkshire with father Joe and mother Mary. I don‘t think the photos in #1 & 4 are the same person. 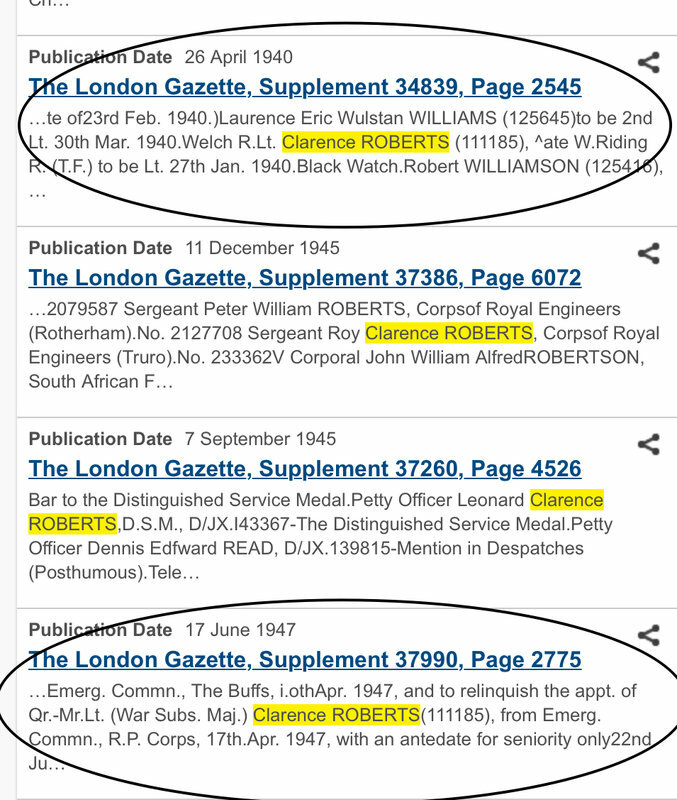 The rank of Lt.Col for Clarence Roberts is post WW2, he was a Major in 1947. I never even considered he served in second world war, he definatly served in first war still need to acertain if it is Indeed him in the photo with the unidentified cap badge ! Hi Max, it appears that Clarence did live in Syston Leicester some time after the War !!! First photo - leave aside at least for the moment. There is enough on Harry and Clarence to look at and if ASC pops up somewhere along the way - a bonus, otherwise just muddies the waters. Could the Private Clarence Roberts be he who was commissioned later. On the face of it not as he (Private) was invalided out according to his medal records. If he had been commissioned, his medal records should have said "to commission" or similar. However, the medal card has an address that seems to fit the family and the date he left was one day before the commission into the same regiment. Addresses on medal cards is something I have only seen on officers cards. Although his medal roll says discharged unfit, he isn't on the Silver War Badge roll. Could the records be screwed up - it happens! Private Clarence (if the right one) went to war before his older brother Harry. The war diary for 174 Siege Battery is downloadable for £3.50 from the National Archives: He was with them from 15 July 1916. 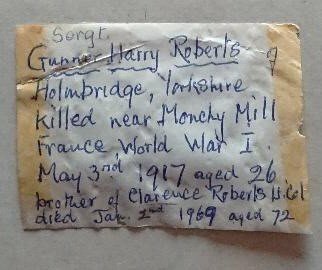 George has mentioned Harry's service papers, to be found on Findmypast and Ancestry as are his medal records. Lt Col Clarence Robert's service file with all its twists and turns will still be with MOD. Youi might like to apply for it, it may reveal whether he started as a private. Few things there to keep you busy? PS (because this is wild) I do see a likeness between the two photos. Siege batteries had a small ASC element attached. Could Harry for whatever reason be wearing a mate's cap? Without the cap he could well be an RGA man. Hi Max, a lot Indeed to keep my busy and pushed out of my family history comfort zone - where to start ??? just looked at the 2 photos very similiar features, could both be Harry, or Harry and Clarence ? any facial recognition technology out there ??? Start by applying for Clarence's officer records It takes a bit of time for MOD to fulfill requests. Then look at Harry's service and medal records on Ancestry or FMP, reserve Private Clarence for later. Download Harry's Siege Battery diary. This was the only battery he served at the front with, you have the start and finish dates so their war is his war. Lots of help always on this forum! Hi Max have ordered and recieved war diary and forwarded to appropriate date and seen entry re casualties. thanks for the link. Great progress, does the diary give any clues as to location which we could then place on a map? Harry Roberts has no known grave however the newspaper cutting that i attach says different - was he possibly burried and the grave and any marker perhaps destroyed by shelling ? I find no cemetery ("interred at" sounds very much like a proper cemetery) under the name given or under any variation thereof, others may fare better. What was the date of the newspaper? His record has a note indicating that on 6 September 1919 an enquiry was made to the RGA record office by the Imperial War Graves Commission about the location of his grave and that they were informed "no particulars available". I imagine a number of scenarios are possible including simple mis-communication perhaps by his battery commander privately. I don't know whether the CWGC would be able to shed light? I may have a theory about the interment using clues from the war diary. The last positions before his death were in the area of Henin sur Cojeul to the south east of Neuville Vitasse. Just up the road and no more than 1000 yards from where the battery was in early May is the small village of St Martin sur Cojeul in which there is a church marked on the trench map. Given the confusion of reports coming back to the family in the midst of the war, I wonder whether "Menin St Martin Arras" could be a garbled version of that village? Arras is seven miles away and the battle of Arras was in full swing when he died. I believe that "Monchy Mill" is also garbled, the place is a long way from any location of the battery but there is another Monchy (Monchy le Preux) much nearer. It has be borne in mind that information coming back home while the war was still on was essentially unofficial and not always to be relied upon. His record shows that the RGA record office didn't have a location for his burial in 1919.